There’s happiness in the fall air for Kurt Busch this year, and it’s not just because he’s one of 12 drivers still alive in the Chase for the NASCAR Sprint Cup. This year, for the first time since 2008, Busch’s beloved Chicago Cubs made the Major League Baseball postseason. Not only that, for the first time since 2003, the Cubs actually won a playoff game. In an elimination round Wednesday night in Pittsburgh, the Cubs prevailed 4-0 in a one-game, winner-take-all matchup with the Pirates to advance to the National League Division Series. And Busch was there to see it person. 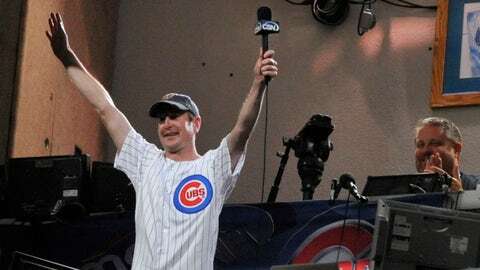 "This year reminds a lot of 2003, when the Cubs were making a run through the playoffs," Busch told FOXSports.com in an exclusive interview. "But we had to get in. We’ve only played one game, but it’s been tremendously exciting to watch this incredible young team, being led by the manager (Joe Maddon). It’s really an exciting year, but I’ve got to stay focused on the Chase and so I don’t if I’ll have a chance to go to another game." Now, the Cubs tackle the hated Cardinals, who beat the Cubs on opening day. "I went to opening day, feeling the energy, feeling the vibe," said Busch. "It was neat to go to an opening day. It was against the Cardinals. They beat us, and I knew they were going to beat us. But we have come a long way in one season. We’re playing loose right now and I like the whole vibe out of everybody." Asked whether it was harder on his nerves to watch his favorite team in the elimination round of a playoff, or to compete in one himself, Busch laughed. But Busch isn’t the only one with playoff fever. Canadian native Cole Pearn’s love for the Toronto Blue Jays goes deep. The Furniture Row Racing crew chief was facing two practice sessions Saturday at Charlotte Motor Speedway, but as crews set up the garage and kicked off the day, Pearn was in the hauler intensely watching the Blue Jays battle the Texas Rangers. 22 years in the making. Lets go @BlueJays !!! Don’t forget about our friend and colleague Kenny Wallace — a diehard St. Louis Cardinals fan. And on the other side of Missouri, Kansas City has the support of Richard Childress Racing. You can watch continuing coverage of the American League Division Series on FS1.